How coconut water can become your holiday best friend? Coconut water is a popular drink in tropical regions such as Mauritius, where it can be harvested naturally. 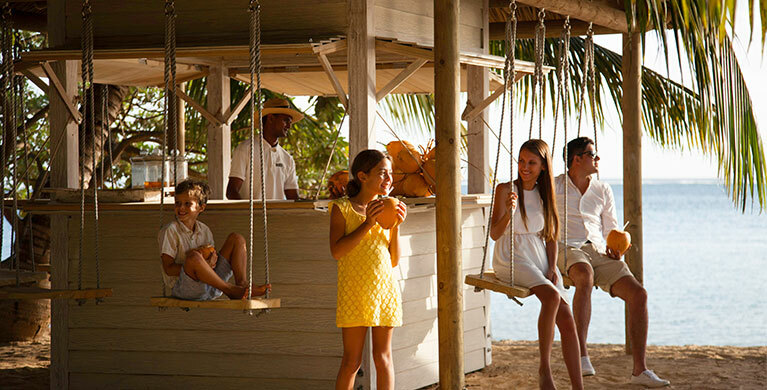 Meet up at Heritage Awali’s Coco Shack, an authentic Creole hut located on the beach, to taste coconut water made in Mauritius and enjoy its benefits. As just said, coconut water is rich in vital nutrients, such as lauric acid, which has antibacterial, anti-fungal and antimicrobial properties. All this helps improve the body’s defences against multiple viruses and diseases… In a word, coconut water is a great preventive solution to avoid becoming ill before, during and after your holidays. Coconut water also contains the five electrolytes produced by our bodies, namely potassium, magnesium, chloride, calcium and sodium. Together, these five elements play a vital role in maintaining the body’s hydration level during physical activities. If you intend to make the most of Heritage Resorts’ activities, whether land-based or water-based, under the sun, remember to take coconut water to stay well-hydrated. Coconut water is a low-calorie drink and 99% free of fat. A glass of coconut water only has 46 calories. Regular consumption of this natural refreshment can help you loose extra weight as it speeds up the body’s metabolism. It might be hard to remain on a diet while on holidays, but coconut water is a great alternative to sugar-packed cocktails. Coconut water contains various bio-active enzymes, which help relieve digestive problems. It has been proved that regular consumption of the “fluid of life” helps reduce abdominal discomfort efficiently. When you travel abroad, your body – and especially your digestive system – sometimes needs to adapt. If you experience stomach troubles, try this 100% natural remedy. Coconut water acts as a lightweight moisturiser, which reduces oil excess on the skin for a silkier feel. You can add it to your bath or to your shower gel. This natural water is also recommended against acne and blackheads. You want to give it a try? Seven Colours Spa offers a range of coconut-based treatments, from body scrub to massage and hair mask. Lauric acid, which is contained in coconut water, stimulates the production of thyroid hormones, thus boosting the body’s metabolism and increasing its energy levels. This is a great solution if you want to fully enjoy your holidays and all the activities on the Domaine de Bel Ombre. You can also rest and relax. Luscious coconut, freshly cut from the resort’s coconut trees and a delicious selection of typical cakes served with ice cream are on offer at the Coco Shack… A little taste of paradise!